Steve R. Allen is destined to create work that leaves an indelible imprint on communities, countries, continents and world cultures. From his earliest days to the present day of creating art presented to Nations, Presidents, Ambassadors and the like, Steve R. Allen's God given talent is readily apparent to all who view his work. Allen's multidimensional style is unrivaled in creating works that figure prominently in the archives of the 20th and 21st centuries. His talent was showcased before a world audience when he unveiled "Uniting Colors of the World", a mammoth eighty feet by twenty-eight feet mural, the City of Atlanta's "Official" commemoration of its hosting the 1996 Centennial Olympic Summer Games. 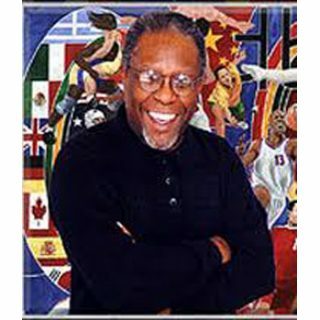 He was also designated an "Official Artist" for the Atlanta Organizing Committee for the Olympic Games.In 1999 Steve created "The Legend" for Henry "Hank" Aaron's Chasing the Dream Foundation's 25th Anniversary celebration of Home Run 715 which established the all time Major League Baseball home run record. Steve traveled to Australia to present "On to Sydney" during the 2000 Olympic Summer Games to Lord Mayor Frank Sartor and the people of Sydney on behalf of Atlanta and the United States. He also created "Olympic Zeal" and presented the artwork to the Federated States of Micronesia on behalf of the United States. The painting honored FSM's initial participation in the Olympic Games. In 2001, he was commissioned by the City of Chula Vista, CA to create an Olympic sports painting that was presented to, and is on permanent display in, the ARCO Olympic Training Center in Chula Vista. Steve became involved once again with the Olympic Movement when he was commissioned by the United States Olympic Committee to create "Spirit of the Games" as its "Official" commemorative of the 2002 Olympic Winter Games. The painting was presented during the Games in Salt Lake City, Utah. The painting is on permanent display at USOC headquarters in Colorado Springs, CO.
Steve was commissioned again by the United States Olympic Committee and created the painting "USA!!!" for the Pan American Games held in Santo Domingo, Dominican Republic in the Summer of 2003. The painting is also permanently displayed at USOC headquarters. Steve presened a giclee of "USA!" dedicated to the 2003 Pan American Games in Santo Domingo, along with others significant to the Academy, such as "Sweetness", e.g., Walter Payton. Admiring the painting is Dr. Thomas P. Rosandich, President and CEO of the United States Sports Academy, and looking on is Kay Daughdrill, Curator of the American Sport Art Museum and Archive. This gifted artist has been featured in numerous national magazines, periodicals, newspapers as well as appearing on national and international radio and television. Heralded internationally for his exceptional God-given talent, Steve R. Allen is destined to create work that leaves an indelible imprint on communities, countries, continents and world cultures.